Plastic shower caddy is more durable because of its totally rust-free quality. A shower caddy can be of various makes and styles. You may pick a steel one, an iron one with powder coat finish, a modern stainless steel one, a chrome finish one that has a very cute shiny look to suit your contemporary lifestyle, or a plastic shower caddy that comes in hundreds of designs and shades with lot of creative models. Be it a hanging shower caddy or a corner shower caddy, a plastic shower caddy is more durable because of its totally rust-free quality. You must however go for a very high quality plastic with neat finish, as it has to be sturdy enough to hold all the weight of your bottles. A plastic shower caddy is also advantageous because of the variety of colors that are available. You can choose one to exactly match the color of your bathtub and other accessories in the bathroom to give a fantastic look. You must give equal importance to the high quality, fancy look, and matching color. These plastic caddies are not very costly and are quite affordable than the metal or chrome caddies. You can think of buying a shower caddy made of plastic for college dorm rooms or homes, as these are offered in amazing shapes in a reasonable price. Most of the plastic caddies are offered in white, as this can almost match all decors of your bathroom and also they are very appealing. Some plastic caddies offered by the Zenith are impact-resistant and are made of high quality plastic. 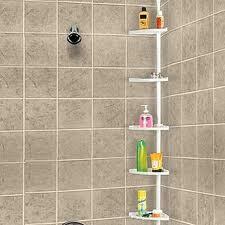 The Interdesign shower caddy is made of shatter resistant plastic with brushed steel accents. The top most rack has holes for draining and to hold the containers upside down. This also includes design to hold towels, razor, and scrubber. The endless options of the innovative designs and colors just amaze you and at times confuse you while deciding which shower caddy to pick.